Hi there, Lolli Bros holds their exotic animal sale 4 times per year, Spring in April; Summer in July; Fall in September and Winter in December. 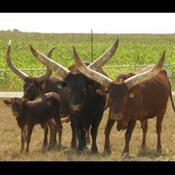 The watusi sale at the 2013 December sale will be held on Thursday, December 12. You can see what is consigned by contacting the sale barn and/or checking out their website at wwww.lollibros.com. It is hard to fix a price as it is an auction. The prices depend upon the quality of the animal, the buyers in the audience, the time of year and such. The prices will vary from hundreds of dollars to thousands of dollars.